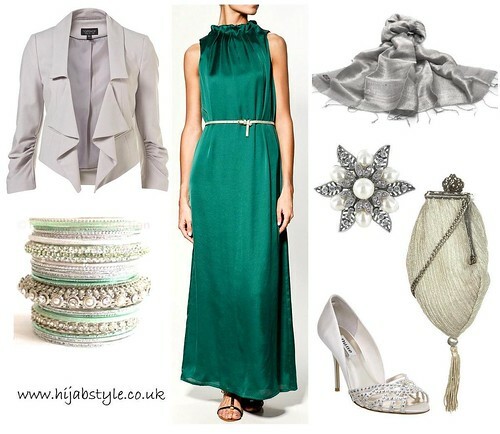 Pleated dress £69.99; Zara; Grey slash lapel crop jacket, £58, Topshop; Mixed bangles £23, The Inayah Collection; Thai silk scarf classic £15.95, Demure Look; Majique antique silver pearl & crystal ring £12.50, Treasure Box; Silver frame tassel bag £35, Topshop; Vanill strappy diamante sandals £48, Dune. Love that green dress, so pretty! green is my fav colour. its beautiful! Beautiful dress, but why green and grey? ?